This is easy to use, easy to apply and quick drying (about 3 minutes a coat). The formula is quite thick but easy to work with and it only requires one coat! It's a very pretty holo and looks good in the sunshine! Only wore this for about 6 hours so don't know how well it would have lasted. Only used a regular base coat, not an aqua one! 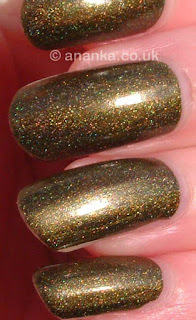 Nice holo, military one ;) Pretty sparkle! Oh it looks great Ananka! It's not really my colour, but I love how pretty the holo looks! Its a fantastic color so classy and chic! Many kisses! Have a great weekend!!! Have a nice weekend Ananka! I could wear it...a lot! It is irresistible holo! I think it looks really nice on you! And it sure is great when the sun shines, we're not that spolied with that either in Sweden this time of year.